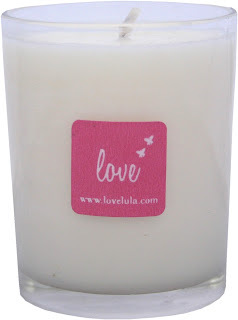 We're into giving out the love here at Love Lula...which is why we give you reward points on all your online purchases, why we offer free delivery on all orders over £50 and now you can bag yourself an exclusive Mini Love Lula Love Candle for free. The 100% natural mini Love candle is made from the same organic plant wax and scented with the same pure rose geranium essential oil as our big Love Candle and burns for approximately 10 hours. It's free when you spend £75 or more at Love Lula and enter the coupon code LOVECANDLE on the shopping basket page.